Nice day for a run - 57 and felt good. Forget the watch and the time- just felt good to run for the love of running. Better run today. Been such a busy week, looking forward to a break. 8 AM, 4 PM. Relaxed run today, just debating some options in my head. 61 during the run.... a bit warm but I really cannot complain at all. Going to check out how everyone did today. Warm day, good crisp run. Swallowed the first bug of the season and ran by the first bee hive of the year. They were pretty aggressive... I will have to take a wide turn in the days to come. PM quick 4, 86 degrees, too hot for me... so I ran it faster to get back in! Maybe not the smartest thing. Running.. different today. Started out, legs tired- left foot hurt a little. 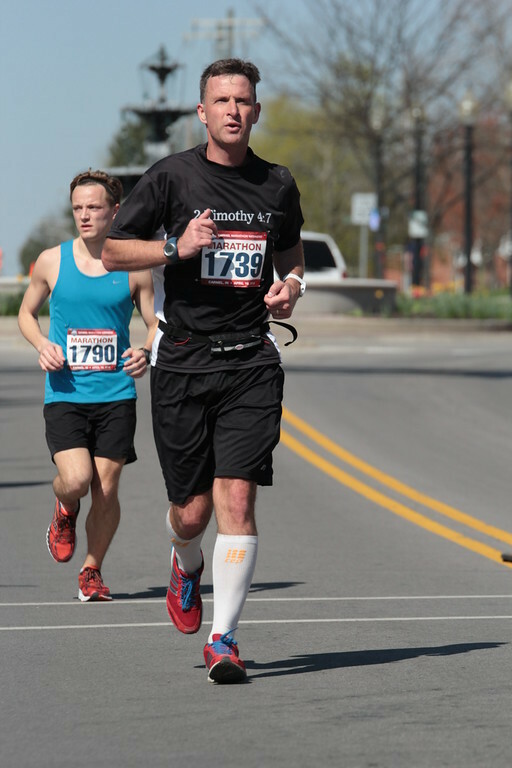 Pain left by mile 2 as I drifted into thought. Saw a crow eating a dead rabbit, that put me back, at least enough to avoid the bees. Overall warm for me but run turned out decent. A little later start for my longer run today since the oldest works and helps out at a horse camp. A little light rain on and off throughout the run. After warming up to some Cardio X my legs felt good to hold a better pace today, nothing blazing but a good steady run. That was until about 15 miles in, when I got the great idea to take a detour on my route and run the nearby hills on tired legs. Yes, THOSE HILLS (one person here knows what I am talking about, they are quite challenging), so mile 15+-19+ were hill running and although it really pulled down my overall time, it was worth it to me and hope it strengthens my late race endurance. I really would like to know my splits, but still Garmin-less so I have my overall pace at 8:16/mile - however I know the first 15 were well below 8 after throwing a few projections on what I ran those hills at. Yard work to come! Could not run this am, back was too sore, after work was able to loosen up just enough to get 4 in. Hope tomorrow is better. AM- got up and I thought after a quarter mile I was going to have to pack it in due to the back bothering me again, but it did loosen up a tad to let me get 3 miles in. PM- better. not good, but better, allowed me to run 6. Tomorrow I have an all day event with teens at Kings Island (Amusement park- roller coasters baby!) so I hope the back is even better. I will try a morning run before we leave to loosen it up. Back is sore, but each morning a tad more forgiving. Today it allowed a nice easy 4- I probably could have pushed a little further, but I want it better and with the rest of today walking around and riding coasters (I am so not missing that...back or no back) I think it was the right amount of running. What a fun day at Kings Island. The youth loved it and I am a junkie when it comes to thrill rides. My back made it just fine and is a little better today. I hope it is 100% in a few days. AM- 6 miles, there are so many ducks around the area it is crazy... all the rain we had makes me wonder if they have set up nests around here. PM- 5 miles, a little warm for me, but good after the monster day of work and I still have things that need finished. PM 3 miles. I found the legs I lost this morning. Just wanted to stretch some more. In PA, catching up with the hotel wifi. So Monday morning, my 4:30am run before I hit the road got snuffed out. I got up and boom... hail.... boom lightning... ummm ok so I hit the shower and the road and managed to get 6 tm miles in last night. Today up early and did 5am miles on the tm with some sub 6 striders. Good day of audits, then to Youngstown. Ran outside here with no tm available, 6 base this evening. Work up a little late (5am) and had a decent drive this morning, so I went out for a quick mile. I caught a little time before dinner for a short 5. Legs just did not feel right today, not really sure why. Felt decent today, probably because I was able to get out early in the nice 58 degree morning air. One can get used to that. I still have that lingering back issue, but hope it continues to get better as it makes it a literal pain just getting shoes and socks on. Nice relaxed 16, avg 8:15 pace. The oldest has some friends coming over so we can have some fun with animated movies... today is Megamind. We are strange, but we love laughing at those things. Hope everyone is enjoying their holiday. I certainly enjoyed the day off work, did some fun cooking and had Chipotle to boot. AM 6 miles, nice at 68 degrees, LOTS of walkers out this early morning. PM 5 brisk miles, had a bike pacer - 88 degrees....at least the humidity was not horrid. Sleeping in the tent with my 10 year old tonight, she is so excited about it. I have tomorrow off too so we will have fun with it.